Trompe-l’oeil ceramics such as this porcelain étui modelled after an asparagus tip were all the rage in Europe and England during the 18th century. Etuis are small ornamental personal cases that were used to carry toiletry items or sewing tools, and would have been used primarily by women. Other examples of trompe-l’oeil ceramics included tureens made to resemble vegetables or animals. Etuis fell under the trade category of ‘toys’ and were often dismissed as frivolities. [i] The asparagus’ attractive form might have been the simple reason behind the design of this trompe-l’oeil object. The shape of an asparagus stem lent itself well to an item such as an étui as its naturally elongated form could easily be translated into a portable container for narrow objects such as sewing needles and a bit of thread, or a small pair of scissors. 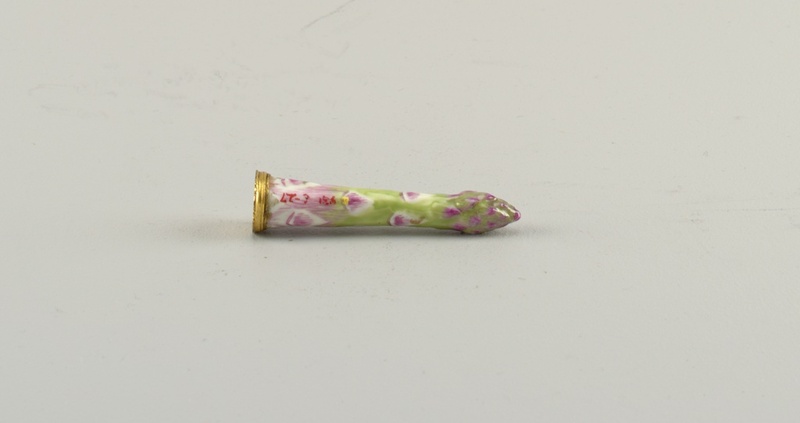 This étui, probably made in France, depicts an asparagus tip, which could signal that its designer was aware of gastronomical norms of the time and chose to model it to imitate the more palatable part of the asparagus. A lady carrying this particular étui would have been aware of the underlying meaning of the vegetable it depicted, and might have used what it insinuated in social situations, or perhaps to communicate something much more amorous. [i] Object file, accession number 1931-6-27, Product Design and Decorative Arts department, Cooper Hewitt. [iii] Menon, Cuisine et Office de Santé (Paris: 1758), pp.30-1. [iv] Susannah Carter, The Frugal Housewife (Philadelphia: James Carey, 1796). [v] Charles Carter, The Compleat City and Country Cook (London: 1736), pp.4, 18, 66, 143.